When I said that a bottle could get none more black than Ardbeg Dark Cove's, I was wrong. Highland Park Dark Origins's bottle is in fact more black. Scotch companies seem to like to use the whole foreboding thing in their product names -- Dark Cove, Dark Origins, Loch Dhu, Tempest, Storm, Storm, Storm, also Storm, and who could forget Dark Storm. And I guess a gigantic killer whirlpool (Corryvreckan) counts too. What this scariness really attempts to do is cover the lack of age statement on all of these whiskies. Except Loch Dhu 10yo, and that worked out so well. 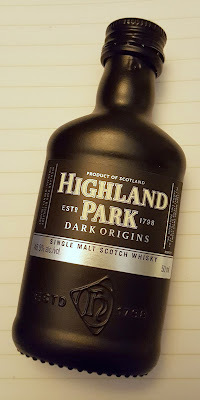 Ignoring the rest of those, today's review is of Highland Park Dark Origins. There appears to be conflicting reports about whether or not this NAS bottling is replacing Highland Park's 15 year old. If you google "Highland Park 15 discontinued", you'll find the answer to be both yes and no, with those yeses and nos both coming from brand reps. If the answer really is yes (which would stink), then the only way Dark Origins is really "replacing" the 15yo is in its price point. 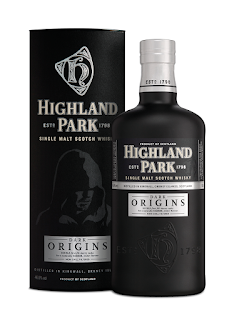 The 15yo was the HP whisky with the most American oak influence, meanwhile Dark Origins focuses on the sherry. It is possible they brought the Dark Origins to the market while they gradually phase out the 15yo because they want to have enough older stock for the more popular 18 year old. But that's all theory at this point. HP15 is still rather easy to find. For now. Here's the tasting. The color is of a 12 year old bourbon. There's a lot of rubbery sherry in the nose. In fact, that's the main element. Then there's dark chocolate, menthol, and walnuts. After 20 minutes, it opens up a little bit, showing some mango juice, red berry notes, and pencil shavings. The palate starts off with horseradish, roots, and arugula. But the notes are too mild to really be exciting. Just a slight bitterness. More rubber sulphur and a hint of dried berries. After 20 minutes, there's more sherry, more berries, more sweetness, and a metallic note. The finish is green and dirty like the palate, but, also like the palate, not bold enough to be of much interest to those of us who like that style. There are also brief notes of bubblegum, sherry, cinnamon, and bitterness. It's of a good length and gets sweeter as it goes. The nose is a little more salty and floral, but otherwise pretty similar. Still plenty of rubber. Maybe some plastic and caramel. The palate is much quieter, though somewhat sweeter. The rougher notes have nearly vanished. Some more sherry shows up, as does some pepper. Black pepper, cinnamon, sugar, and a hint of mesquite chips in the finish. First off, I'm with Team MAO/Sku. This is definitely sulphurous. Some of European reviewers call it smoke or peat, but to me this reads as sulphur. Peppery sulphur, struck match sulphur, and lots of rubbery sulphur. I find barely any actual smoke character, except maybe in the finish. I have to say, I don't get this whisky. It's unlike the rest of the HP range, but not in a fun way. It's not terribly complex, nor is it a pleasant drink, nor is there much in the way of good mature spirit showing. Plus the sherry element cannot compete with the richness of the rest of the HPs. It's not a bad whisky. It's fine, but the rest of the regular range (including the 15) is damned good. Dark Origins is preferable at its bottled strength. Having lowered the abv to 43, I can see why they didn't bottle it there because it thins out and washes away. Had those green and dirty notes been amped up a bit in the palate then this could be recommended as a cool quirky Highland Park. But they're not, so I'll stick to the rest of the regular range. I think this bottle is officially hitting the point of "none, none more black." I wasn't aware Edrington was making miniatures of Dark Origins. If I happen to find one, I might give this whisky a try because I'm not too keen on paying that much for a full size bottle. I would recommend that as the approach as well, or if you can find a bar that has it on the shelf. I found this mini in Arizona. I heard this one will be discontinued, any idea if this is true? Hey Randall. Yep, they're replacing it with a trio of NAS: Valkyrie, Magnus and Full Volume (WTF with the names?!). They're all "limited" and there are other "limited" releases coming in the future.